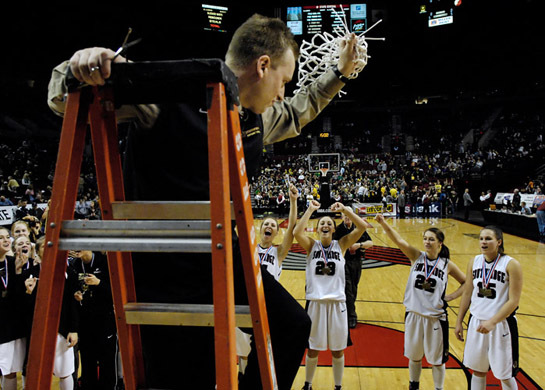 2010 was the year the Metro League displayed its dominance in Oregon high school 6A basketball as all four teams vying for the state title in the the boys and girls championship games were from the Metro League. The Jesuit boys over-powered Westview 66-44 to win their third straight 6A title. The Jesuit girls faced Southridge in their championship game, but a first place finished eluded them once again has the Skyhawks claimed their fifth championship in as many appearances in the title game with a 48-37 victory. The Jesuit girls have finish second in each of their three 6A championship game appearances. 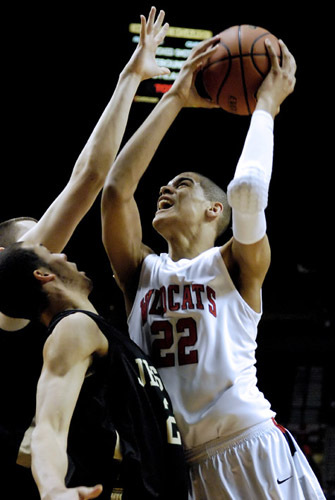 Garrett Jackson (right) of Westview goes up hard against Jesuit's Jordan Akwenuke (center) and Kyle Wiltjer (hidden) during the opening quarter of the OSAA 6A Basketball Championships. Zane Yanzick of Jesuit glides in for a reverse layup at the tail end of a third quarter break-away. 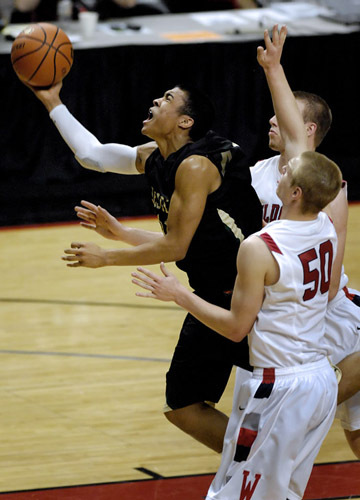 Stephen Holt of Jesuit breaks between the defense of Westview's Michael Leunen (50) and Austin Kuemper (behind) as he drives the lane for two of his game high 23 points. 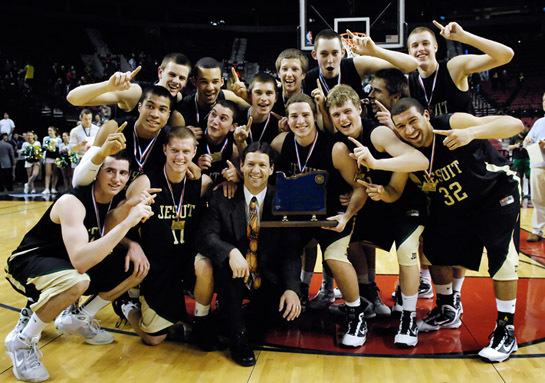 The Jesuit Crusaders celebrate their fourth state title in their seventh appearance in the championship game. Elizabeth Brenner (left) of Jesuit wrestles Southridge's McKenzie Dalthorp (right) for a rebound during the opening quarter of the OSAA 6A Basketball Championships. 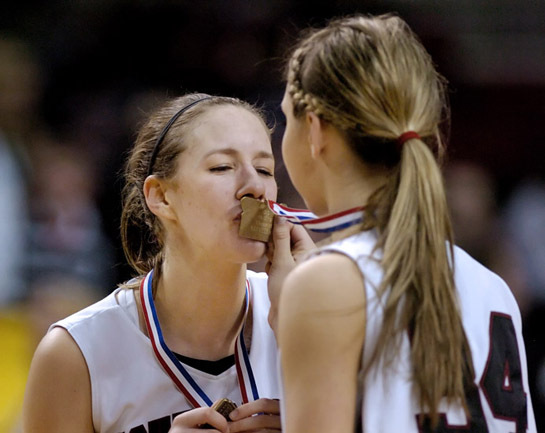 Aubrey Ashenfelter (left) of Southridge kisses the championship medal of teammate Allie Brock during the awards ceremony following the Skyhawk's 47-38 title victory over Metro League rival Jesuit. Southridge head coach Michael Meek makes the final cut of the net during the awards ceremony after the Skyhawks won their fifth state championship title by defeating Jesuit 47-38. 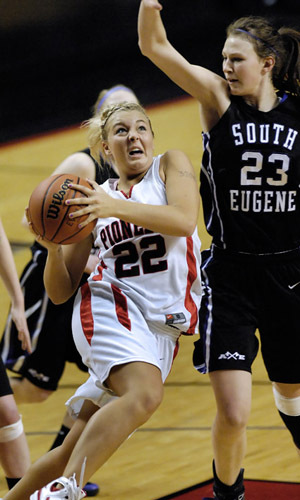 Ashleigh Anderson (22) of Oregon City drives hard to the basket against South Eugene’s Jessica Shivers (23) late in the fourth quarter of the OSAA 6A Basketball Championships third place game. Taylor Belmont (left) of Oregon City flies by South Eugene’s Jessica Shivers as she drives for a layup with 5:55 left in the fourth quarter. Johanna Paine (left) and Brittany Knighton (right) of Oregon City attempt to wrestle the ball away from South Eugene’s Mackenzie Kerins during a first quarter scramble.